It wasn’t long ago that you either had a shovel or a very large loader, but nothing in between. Today, a vast selection of innovative skid-steer, compact track loader, all-wheel steer and mini track loaders can add efficiency and versatility to a variety of projects. Whether you are planning a purchase or trying to match an existing machine to a particular project, there are several variables to consider. For those unsure what those factors are or how to evaluate them, choosing the right compact loader can be challenging. Does it need to work well in tight jobsites? Does it need extra traction for pushing piles on soft or muddy ground? Will material be loaded into a truck, requiring extra lift and reach? Will it be accessing gated areas or backfilling footings? Answering these questions and achieving the best fit for an operation starts with an understanding of the primary types of compact loaders, as well as the features and attachments that can help tailor the machine to jobsites and tasks. These five steps can help narrow down the choices. There are four different types of compact loaders, each designed to provide varying levels of power, lifting capacity and mobility. Skid-steer loader: This loader type is differentiated by its type of steering. As the name implies, the tires on the left side work independently of those on the right side for greater maneuverability. Compact track loader: A loader with rubber tracks has good tractive effort and low ground pressure, which significantly increases mobility on soft, muddy and unpaved ground conditions. All-wheel steer loader: When working on projects that require minimal ground disturbance, an all-wheel steer loader may be your best choice. This type of unique loader steers with all four tires and also has skid-steer capabilities to maximize versatility. Simply press a button to toggle between skid-steer and all-wheel steer modes. Mini track loader: This small, agile track loader can work in limited space with minimal ground disturbance. The size typically allows operators to walk behind or ride on the unit, depending on the model, and it is easy to load and transport on a trailer. 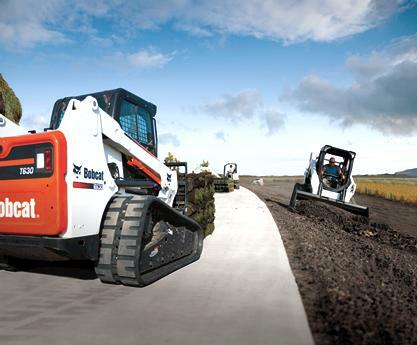 Due to their tires, skid-steer and all-wheel steer loaders have mobility and wear advantages on paved surfaces. This makes them the preferred choice for many demolition, renovation and snow removal applications. Solid tire option is available for applications such as demolition and recycling. Because compact track loaders have more area in contact with the surface, they can provide greater pushing and digging power. A compact track loader will dig and load more material in the same amount of time, or the same amount of material in less time, due to superior traction capabilities. In many parts of North America, a compact track loader will add months to the typical contractor’s working year because of its ability to float on wet, muddy ground. When it comes to lift-arm design, most manufacturers offer a choice between loaders with a radius- or vertical-lift path design. Radius-lift-path loaders raise the load in an arc that provides maximum reach at truck bed height. A radius-lift-path machine excels at jobs with mid-range working heights like dumping material over a wall, backfilling or loading and unloading flatbed trucks. Vertical-lift-path loaders provide higher lift capacity and more reach at full lift height than a radius-lift-path machine. Because maximum reach is achieved at full-lift height, it is easier to clear high-sided trucks and hoppers. If lifting and loading of high-sided trucks is not necessary, it is less expensive to purchase a radius-lift-path machine. However, while vertical-lift-path machines have a higher initial cost, they usually command higher prices at resale time. The other factor in lifting performance is the compact loader’s rated operating capacity (commonly referred to as ROC). Excavating and landscaping contractors generally need compact loaders with higher rated operating capacities because they move a lot of dirt, aggregate and other heavy loads. General contractors, on the other hand, may prefer a smaller, more versatile machine that can work in tight areas. If most of your work is done in an existing development or on paved or improved surfaces, skid-steer loaders are the best choice. Not only do they have a lower initial cost for the same size machine, but they have lower ownership costs. While rubber tracks should last about twice as long as tires with proper operation, tires still cost considerably less. Tracks: Rubber tracks for a like-sized loader range from $2,500 to $4,000 for a set. The average track life is between 1,200 and 1,600 hours for general-purpose, general-use machines on hard ground. The long-life end of the spectrum for loader tracks used mostly on soft dirt and soft clay can surpass 2,000 hours, where daily operation on hard pavement surfaces like asphalt or concrete may only provide useful life for 400 to 800 hours. Utilization is key with any compact loader because the more frequently you use it to fit your job applications and the more attachments you can put on it, the faster you realize a return on your investment. A key financial advantage of owning a compact loader is that with the purchase or rental of several different attachments, you can build a higher utilization rate compared to operating and maintaining several different pieces of dedicated equipment.